ST. GEORGE — A head-on collision involving a wrong-way driver on Interstate 15 in Weber County sent one driver to the hospital and another driver to jail early Saturday morning. Shortly after 12:30 a.m. Utah Highway Patrol and other emergency personnel were dispatched to a reported rollover on northbound I-15 at the Riverdale Road exit in Roy involving two single-occupant vehicles, a white Maserati and a white Isuzu Trooper SUV, according to a statement released by UHP Trooper Lawrence Hopper. The driver of the Isuzu was transported to McKay Hospital in Ogden with serious but not life-threatening injuries, including a shattered pelvis and severe cuts on her head, Hopper said in the statement. The driver of the Maserati, later identified as 44-year-old Gary Shook, was also injured in the crash, suffering lacerations to his head. Troopers learned during the investigation that the driver of the Maserati was southbound in a northbound lane of I-15 when the incident occurred. The Maserati struck the northbound Isuzu head-on, which flipped the SUV up and over the cable barrier before it crashed onto the left shoulder of the interstate on the southbound side. The driver of the Maserati had been consuming alcohol before he started driving, Hopper said. Shook was transported to the hospital to be treated for his injuries, and once discharged, he was arrested for driving under the influence and booked into the Weber County Correctional Facility in Ogden. 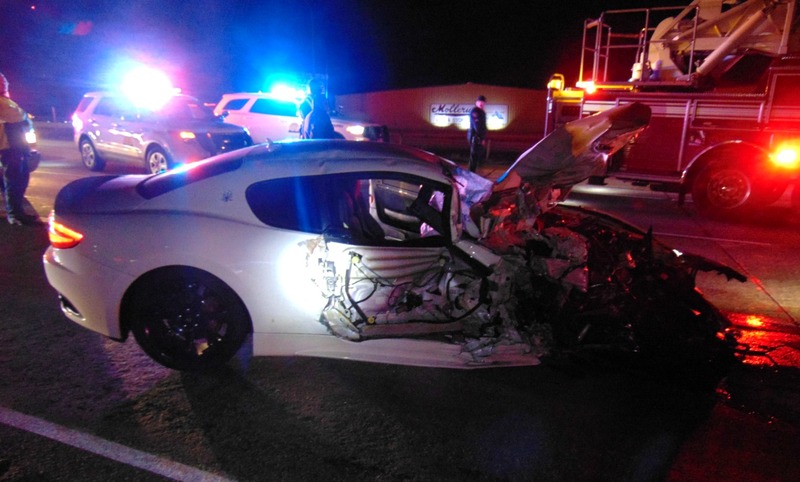 The driver of the Maserati could face additional charges after the crash investigation report is forwarded to the district attorney’s office, Hopper told St. George News, noting that, due to the severity of the crash, the DUI count could be enhanced. Hopper added that any head-on crash that involves freeway speeds is, more often than not, unavoidable, due to the driver having so little time to react, if any time at all. “Always, always wear your seat belt,” Hopper said. SLC Local TV News played a dashcam video recorded by a taxi driver of this accident. The outcome could have been fatal for both drivers. The Isuzu SUV frame structure and ride height advantage might have been a factor. Let’s hope the DA explores more serious charges, as a result of the severe damage to an innocent driver.